If you are looking for Dwarf lilies to grow in pots, then the dwarf Asiatic liliums are the best. They will flower from late spring into summer and reach around 40cm in height. 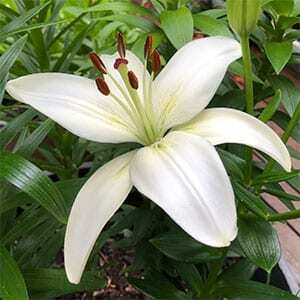 Available in a range of colours including whites, pinks, orange, bi-colours and pastels, these are not a fragrant lily, so they can be grown on patios and outdoor entertaining areas without being overpowering . Grow them in a large container or planter box, but not to tall as the flowers do face upwards. These dwarf varieties have strong stems and cope well without support. Good glossy deep green foliage lasts well, and the best time to plant them is in late winter. For a 40 cm pot you will need around 8 – 10 bulbs tp make a good dense display. Choose a position in good morning sun with a little afternoon shade, strong filtered light will usually work, deep shade is not suited. Use a pot that will hold at least 3 – 5 bulbs, planted at around 7cm apart. Ensure that drainage is good to prevent fungal problems. Plant the bulbs at around 15 cm deep. and 7 cm apart. Keep the soil moist but never wet. A light mulch around the plants once they appear in spring will help ensure a cool moist root run. A little general purpose bulb fertiliser once the lilies begin to grow will be beneficial to growth and flowering. Watering during dry periods in spring will assist with better flower production – Do Not Overwater. If you choose to pick the flowers, leave at least 1/2 the foliage on the stem to feed the bulb for next years flowers. You can dig and divide or store the bulbs once the foliage has dies back complexly. Dwarf Lilies are usually available for sale from winter to early spring, check with listed participating suppliers.